LINCOLN, Neb. (2017) – A few years ago two experienced psychotherapists, Ann Todd Jealous and Caroline Haskell, decided to take a closer look at how white Americans have been hurt by the legacy of an ideology of racism created by their ancestors. 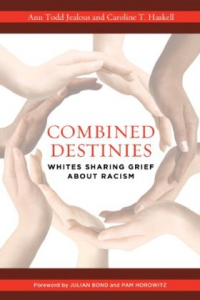 Combined Destinies: Whites Sharing Grief about Racism Combined Destinies (Potomac Books, 2013) is based on the premise that for positive and lasting change to occur, it is necessary to open hearts as well as minds. The publication of this book triggered readers’ experiences growing up and living in a country with a racist ideology. This courageous anthology posits that unearned privilege has damaged the psyche of white people as well as their capacity to understand racism. Drawing on the intimate stories of diverse contributors, Combined Destinies is organized thematically, with individual chapters focusing on topics such as guilt, shame, silence, and resistance. “With the stories in Combined Destinies, Ann Jealous and Caroline Haskell take us another step forward toward understanding the legacy of racism’s impact on all children,” said Marian Wright Edelman, president of Children’s Defense Fund. For more information, please visit the book’s website: combineddestinies.com or be in touch with Caroline T. Haskell at chaskell@csumb.edu. The authors are available for interviews and presentations. ANN TODD JEALOUS is a former marriage and family therapist with a long history of supporting civil rights. CAROLINE T. HASKELL is a licensed clinical social worker and founding director of Health and Wellness Services at California State University–Monterey Bay and the campus affiliate director for the National Coalition Building Institute in Washington DC.